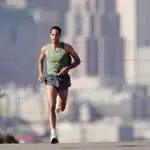 Exercising Outdoors: How Does Pollution Affect Athletes? Air pollution is increasingly on the minds of many athletes, especially those with outdoor workouts. Concerns about air quality in cities, climate change, automobile emissions and other environmental issues have driven a recent boom in studies of air pollution's medical effects. Most studies have not used exercisers as subjects, but their results have implications for exercisers, who breathe with particular vigor and oomph. On the Internet, fitness chat rooms resound with worried postings about air quality. As one cyclist wrote on SoCalCycling.com, "During the summer months, I have to ride in the morning and be home no later than 11, otherwise I will feel miserable and cough all day long." While air pollution affects exercisers at all levels in cities around the world, elite athletes and their retinues are also looking with trepidation toward Beijing, the site next year of the Summer Olympic Games and one of the most polluted cities in the world. Dr. Kenneth Rundell, the director of the Human Performance Laboratory at Marywood University in Scranton, Pennsylvania, said, "Athletes typically take in 10 to 20 times as much air," and thus pollutants, with every breath as sedentary people do. He was the chairman, in May, of a scientific session on air pollution and athletes at the annual meeting of the American College of Sports Medicine. Still, virtually every expert interviewed said that people should not stop exercising outdoors. Rather, they suggested that exercisers should keep their distance from exhaust-spewing cars and check air- quality forecasts before venturing out. A 2004 review of pollution studies worldwide conducted by the University of Brisbane, Australia, found that during exercise, low concentrations of pollutants caused lung damage similar to that caused by high concentrations in people not working out. Given what can be in the air, "people who exercise outdoors should probably be more worried" than many are, said Dr. Morton Lippmann, a professor of environmental medicine at the New York University School of Medicine. And there are long-term consequences. A study that used the mass of data included in the Women's Health Initiative found that women who lived in communities with relatively high levels of air pollution in the forms of tiny particles--also known as soot--were far more likely to die because of heart attacks than women who lived in cleaner air. Results were published in February in The New England Journal of Medicine. "Fine particulates are definitely something to worry about," said Rundell, especially for athletes, who, in the process of exerting themselves, "can take in very elevated doses." That may go against conventional wisdom. Most people, when they think of air pollution, think first of ozone, a ground-level gas created when sunlight reacts with pollutants emitted by cars and factories. Ground-level ozone, popularly known (and loathed) as smog, has long been recognized as a threat to cardiovascular health. "Ozone over the long term causes what is similar to a premature aging of the lungs," said Dr. Michelle Bell, an assistant professor of environmental health at the Yale School of Forestry and Environmental Studies. But today most experts agree that, as Lippmann said, the "greatest overall public health impact" of air pollution comes from fine particulates, which can be seen only with an electron microscope. They are ubiquitous. Cars, trucks and diesel buses--the main culprits in the creation of particle pollution--spew untold millions of the microscopic pollutants into the air daily. Exercisers should take precautions against particles, experts said, by not exerting themselves near traffic, or, if they must use a path next to a highway, staying a few hundred yards away from vehicles. Particles can sail past nasal hairs, the body's first line of defense, and settle deep in athletes' lungs. Some remain there, causing irritation and inflammation. Others, so tiny they can bypass various bodily defenses, migrate into the bloodstream. "Blood vessels do not like those particulates," said Dr. David Newby, a cardiology professor at the University of Edinburgh. Newby has seen the effects of those particles on active people. In 2005, he and his colleagues had 30 healthy volunteers ride exercise bikes inside a laboratory for 30 minutes, while breathing piped-in diesel exhaust at levels approximately those along a city highway at rush hour. Afterward, the researchers did a "kind of stress test of the blood vessels" in the participants' forearms, Newby said, and found that the vessels were abnormally dilated, meaning blood and oxygen could not flow easily to the muscles. At the same time, levels of tissue plasminogen activator, or tPA, a naturally occurring protein that dissolves blood clots, had fallen. "Those are ideal conditions for a heart attack," Newby said. A heart attack can start when arteries constrict and a clot forms. Without sufficient tPA, the clot is not dissolved, the artery is blocked and the heart is damaged. No one is sure yet just how the tiny particles become such a threat to the heart. Early research suggests that it may be because they do not work alone. "The particles have almost no mass but a great deal of surface area," Lippmann said. In the air, they attract chemicals and circulating heavy metals, which attach themselves to the particles, and, in effect, hitchhike a ride into the lungs and bloodstream. It is not clear whether resulting inflammation and problems are caused by the particles themselves or their passengers or both, Lippmann said. Still, it is not wise to give up outdoor exercise, even if, as Bell put it, there is a "trade-off between physical health from exercise and damage from air pollution." "Be sensible and try to cut back" on your exposure to particles, Rundell advised, but don't use pollution as an excuse to cut back on exercise. In the calculus of health concerns, "Breathing air pollution is not nearly as bad as smoking," Lippmann said. "The bottom line is that running and cycling are healthy and, overall, good for the heart," Newby said. With proper care, he said, outdoor exercise does not have to be harmful--and, done en masse, could even ease pollution. "I ride my bike back and forth to work every day," he said. "If everyone else did that, too, we wouldn't be having this problem at all, would we?"